The NIH Mark O. Hatfield Clinical Research Center in Bethesda, Maryland. The young Dr. Joseph J. Kinyoun probably would not have predicted the staggering outcome of his efforts as he focused on a comma-shaped cholera bacterium through his microscope in a small lab in 1887. One of the most powerful forces behind medical research has its roots in that one-room laboratory in Staten Island, New York. The scientist’s efforts to improve public health evolved in less than a century into the National Institutes of Health (NIH), one of the world’s top medical institutions and the focal point for medical research in the United States. A Marine hospital service sponsored the lab where Kinyoun ultimately identified a more accurate method for diagnosing cholera. With many more successes, the program expanded, evolved, and moved to the nation’s capital. Today the NIH encompasses twenty-seven different institutions. Each institution specializes in a field of medicine, a public health concern, or a population with special medical issues. Areas of special focus include teen health research, mental health issues, research on aging, and wellness and lifestyle issues. Institutes are also designated for specialties within body systems, such as the National Eye Institute, National Institute of Neurological Disorders and Stroke, and the National Institute of Arthritis and Musculoskeletal and Skin Diseases. Researchers, much like Dr. Kinyoun, are eager to use their knowledge and findings to benefit public health as they lead and support medical research efforts worldwide. 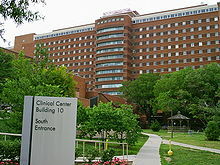 Building 10 of the Clinical Centers. NIH still explores both exotic and life-threatening diseases and the relatively harmless problems such as the common cold. The institutes use their research-acquired knowledge to detect, diagnose, prevent, and treat diseases and disabilities. Another major goal for the NIH is to enhance and better lives internationally by educating the public about health issues. 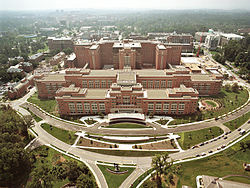 The NCRR (National Center for Research Resources) is a component of the NIH. Its Division for Clinical Research Resources (DCRR) subsidizes the SEPA Program, which funds projects to improve science literacy throughout the nation. SEPA (Science Education Partnership Awards) connects biomedical and behavioral researchers with educators and community groups. These partnerships join forces in creating effective programs which educate the public about health issues, lifestyle choices, and career opportunities in science. SEPA has funded the Pandem Sim: Using Biology to Save the World project to increase high school students’ knowledge of infectious disease, immune responses, and epidemiology topics. Pandem Sim also addresses career awareness of biomedical fields and will hopefully influence the future of public health through students having a greater understanding of infectious disease, epidemiology processes, and the processes of discovering public health care advancements.